Do you have the right number/type of alert devices? The current code calls for smoke detectors in each bedroom and at least one on each level. 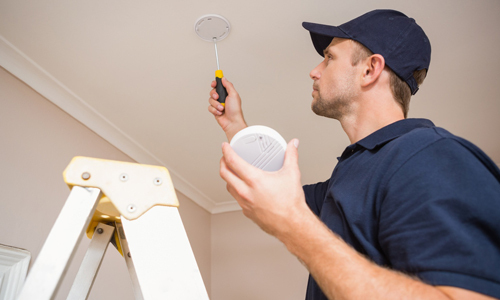 If you have natural gas appliances or fireplaces then you also want carbon monoxide detectors on each level. All units should be less that ten years old. Any new units you install should have the 10-year sealed battery back up. Do you have fire extinguishers? At a minimum you should have working fire extinguishers in the highest risk areas of the home (kitchen, utility room, garage) and you should check the gauges on a regular basis to make sure they are charged. Most importantly, make sure you and your family members have read and understand how and when to use the devices so that you are prepared in the event of a fire. Do you have a plan? You should create plan for what to do in the event of a fire, and just like fire drills at schools and offices, you should practice so that everyone in the family knows what to do in an emergency. Is your dyer vent clean? According to the National Fire Protection Association, nearly 17,000 clothes dryer fires are reported each year with roughly 34% attributed to clogged vents. If your dryer does not appear to be getting your clothes dry in a regular cycle, chances are that it is time to clean the vent. Do you use space heaters, fireplaces or candles? Common sense should tell you not to leave these heat sources unattended or to put flammable objects close to them, but you would be amazed how many house fires result from such negligence. Is your electrical system sound? You should conduct a basic electrical audit to make sure you are using the right kind of extension cords, that you haven’t overloaded outlets and that your small appliances do not have wiring issues. If you have any concerns such as flickering lights, tripping breakers or sparking outlets, do not put off calling a licensed electrician to conduct a thorough inspection. Now that you don’t have to spend time changing smoke detector batteries, we strongly urge you to use that time to conduct a semi-annual home safety review based on the list above. Your family will thank you!